Constantine Loucas Davros graduated from the University of Illinois at Urbana-Champaign in Spring 2016 with two degrees, one in Physics and the other in Italian. He is a Greek American from Chicago. Constantine studied abroad in Verona, Italy in the spring of 2015, and is back there this year to teach in a high school in Crema. In this essay, Constantine examines the differences in prestige and use of ancient and Modern Greek in today’s Europe, referring to scholarly analyses and also to his own experiences as a Greek American. As a young Greek American I often wonder why more people do not learn to speak Greek, as frequently as were the circumstances in days past. The contention could be made that due to its infrequent use, the Greek language has slowly faded into obscurity. How could this be though? At one point in history the Greek civilization was regarded as the zenith of academia, as well as the cultural gold standard. Granted, that point may reside deep within the annals of history, but nonetheless the Greek language’s infrequent use deserves explanation. Knowing Greek isn’t something to be frowned upon, nor is it useless. In fact, it’s quite the opposite. From personal experience I can corroborate the benefits of having knowledge of the language, but for more concrete evidence it’s important to know that, “over 70% of all English words are derived from Greek and Latin. Knowing Latin and Greek prefixes, roots and suffixes will not only help one remember word definitions but will also make it easier to determine the meaning of a new word” (Ruccolo). However, unlike Latin, Greek is an official language of the European Union, as well as a recognized minority language in other member states such as Hungary, Italy, and Romania. With that in mind, it would seem that knowing Greek would serve as an invaluable tool for Europeans trying to learn English. Moreover, it has become standard practice for the European Union “to conduct its official business in English, French, and German” with English being the “most widely spoken and used language in the administrative domain” (Kachru & Smith). Thus, the latter two language’s roles in both the financial and political domains are diminishing. Couple that with the fact that one of the main objectives of the EU is that “every European citizen should master two other languages in addition to their mother tongue” (EU Parliament), it would seem that there is a perfect storm to learn Greek as the second secondary language; assuming English would be the first secondary language. However, statistics show that both in Europe and in the United States, there is no real interest in learning Greek as a foreign language. According to Eurostat, the most studied foreign languages in Europe at the upper secondary level of education are as follows: English 94%, French 23%, Spanish and German 19%, Italian 3%, and Russian 3%. It is clearly visible that there is no space for Greek to fit into the European landscape. 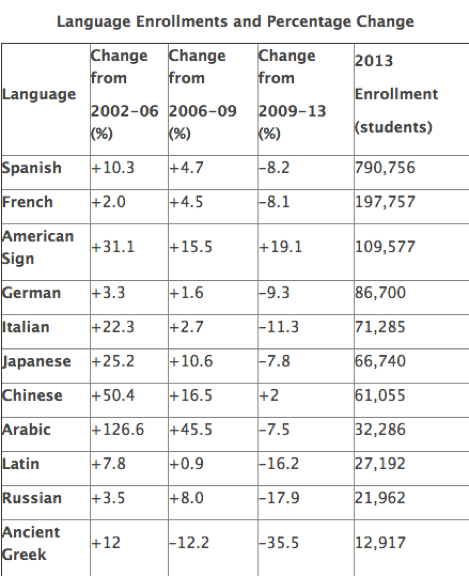 In the United States, enrollments in Ancient Greek language classes are on a steep decline. According to the MLA from 2006 to 2009 enrollment dropped by 12.2 % and from 2009 to 2013 enrollment dropped an even further 35.5% (Flaherty). Thus, we’re still left with the unanswered question, why isn’t Greek getting learned? The answer isn’t a simple one. We could quickly shift blame back through the centuries to the fall of the Byzantine Empire followed by the capture of Constantinople, by the Ottoman Empire in 1453. 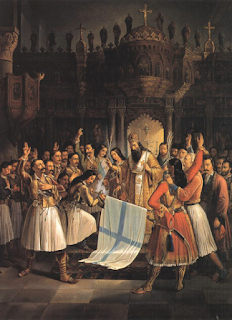 Later, Athens fell in 1458, subsequently followed by an occupation that lasted until the Greek War of Independence, which began on March 25, 1821, and which lasted until 1832 ending with the Treaty of Constantinople. However, it would be easy to attribute all blame on the Ottoman occupation. The Greek language has been plagued by a diglossic debate, between Demotic Greek, spoken by the public, and Katharevousa, considered to be pure Greek (Frangoudaki), for centuries. At the same time, the Greek government, throughout its various political regimes, has made multiple miscues when it comes to policy making. Such issues persisted through the 19th century after Independence was achieved, into the 20th century. “Linked to the national ideology, it was a recurrent debate in the history of contemporary Greece, with many steps forward and backward, always interrelated with the political power in government, until 1976 when, after the fall of the junda, popular Greek was voted as the official language” (Dendrinos, 2). 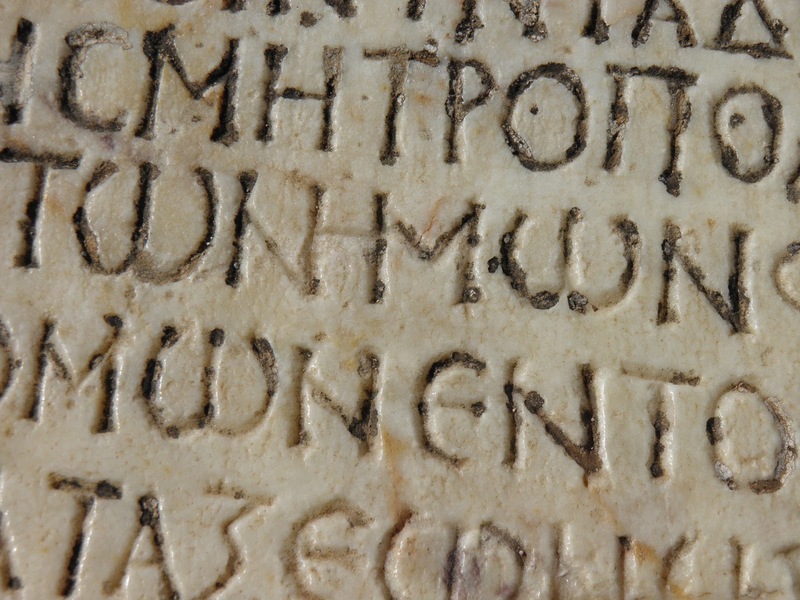 The combination of both external and internal forces seems to have seriously damaged the use and prestige of the Greek language over the centuries. However, under current circumstances it doesn’t seem as though Greek will become the trending language to learn. As David Crystal contends in a video for Macmillan Education ELT, “A language becomes a global language because of the power of the people who speak it. It’s nothing to do with the structure of the language…It’s all to do with power, but power means different things at different times…And then in the 19th century economic power; money talks always” (Macmillan Education ELT). In the 19th century Greece wasn’t an economic powerhouse, and today it is quite the opposite. The Greek Debt Crisis that began in 2010 coincides almost perfectly to the MLA’s reported drops in enrollment. Perhaps a coincidence, but the statistics reflect on the nation as a whole. Nonetheless, the true power and resurgence of the Greek language is inextricably tied to Greece fixing its economy. 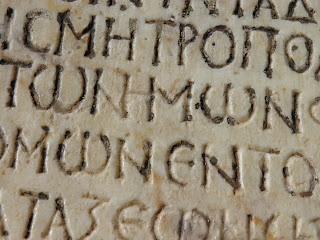 As we know though, the Greek language is still useful; it just needs to be made relevant once more. Perhaps after the financial crisis in Greece is resolved, efforts can be made to restore the prestige of the Greek language, but only time will tell. Macmillan Education ELT. “Global English with David Crystal.” YouTube. YouTube, 01 Nov. 2009. Web. 15 May 2016. Dendrinos, Bessie. “Language Issues And Language Policies In Greece.” (2012): 1-17. Web. Flaherty, Colleen. 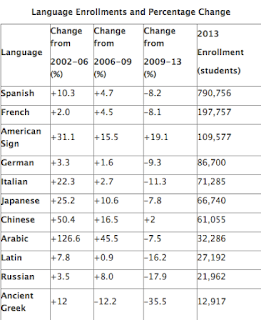 “MLA Report Shows Declines in Enrollment in Most Foreign Languages.” Inside Higher Ed. N.p., n.d. Web. 15 May 2016. Frangoudaki, Anna. “Diglossia And The Present Language Situation In Greece: A Sociological Approach To The Interpretation Of Diglossia And Some Hypotheses On Today’s Linguistic Reality.” Language In Society 21.3 (1992): 365-81. ERIC. Web. 15 May 2016.